Mission is for kids, too! Did you know that there are nearly 200 countries in the world? Each one has its own language, schools, food, games and ideas. In each country, there are many people – all together there are over 7.5 billion people in the world! God loves each and every one of these people. But some people in the world haven’t heard about Jesus. Or they have heard, but don’t know how to respond to the news that Jesus died for them! That’s why CMS sends missionaries all over the world—to share the good news that because of Jesus, everyone can be friends with God! The missionaries around the world who are telling people about Jesus need help. And who’s the best helper? God! That’s why it’s so good to pray and ask God to help CMS missionaries share the good news about Jesus. 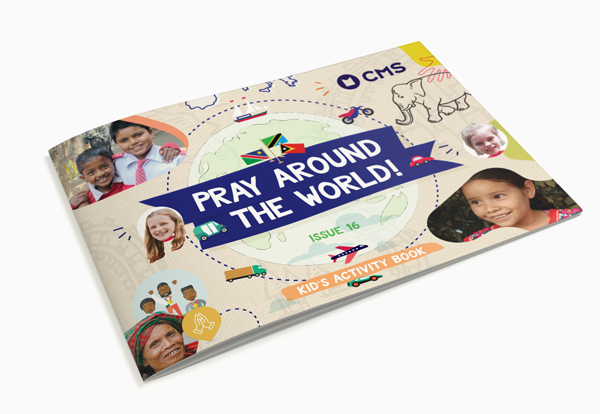 If you would like to get more involved in supporting CMS missionaries, get a copy of Pray Around the World – Issue 16 – it’s is a special activity book designed just for kids like you, full of activities to help you study the Bible, pray for missionaries and learn about global mission. Contact your local CMS branch to grab a copy! Preview sample pages here (2.5MB). CMS missionaries are all over the world! That’s because we are trying to build a world that knows Jesus. But they can’t do it alone! As well as trusting God, they need our help. It’s great for us to know as much as we can about them and the places where they are going, so that we can pray that God will use them to do his work. And did you know that by praying, and helping in other ways, the Bible actually teaches that we are their partners too? (see Philippians 1:3-5). Write an email, letter or postcard to your CMS missionary friends – and let them know what you have been praying for them! You can help raise money to support CMS missionaries as they tell people the good news about Jesus! Download the PDF and follow the instructions to make your own money box. Then collect money to support either a particular CMS missionary or all CMS missionaries. Maybe you could aim to put aside a certain amount of money each week. When your money box is full, donate the money to your local CMS branch. Download the template here (1MB). Have you heard of the Wordless Book? It’s an easy way to tell people the message of the gospel by using colours. Black = sin, red = Jesus’ blood, white = forgiveness, green = growth, yellow = heaven/eternal life. Sometimes there are other colours as well, like purple = adoption and blue = baptism. You can present the story in many different ways, so long as you have the right colours. Here are some examples, but use your creativity to think up even more ways! Make your own book using paper or felt here, or you can print off a colour template here. Make a Wordless Book bracelet which you can wear or give away to your friends. At Easter and Christmas you could make Christmas tree decorations or Easter eggs to give away as friends. Make sure to include a short explanation of what each colour means. If you don’t want to make something, but still want to share the good news, use objects like coloured cars, Lego or other toys to tell your friends and family about Jesus! Do you go to Sunday school or kids club? You can ask your friends if they want to come too! They’ll have heaps of fun hanging out with you and playing games, but best of all, they’ll hear about Jesus! In fact, why not ask your whole class at school if they want to come. The good news isn’t just for your friends, but for everyone! You can tell your friends and family stories from the Bible! Maybe they’ll want to read it with you, or you can memorise the story and tell it back to them like you’re in a theatre. Be dramatic! Put on a play with your siblings or friends, or you can try to do a one-person play for fun. You could also invite your non-Christian family and friends to be in the play as well, instead of just the audience—that way they’ll have to learn the story and you can talk to them about it even more. Pick a story from the gospels about Jesus, or look in Acts and the Old Testament for some more ideas!